Could terminally ill patients get booted from insurance coverage—and get stuck with large medical bills—for seeking access to experimental medicines? It’s a real possibility. Right-to-try laws—which give terminally ill patients access to drugs that haven’t been approved by the FDA—in 19 states allow insurers to deny hospice care coverage if the patient tried a drug through right-to-try, and some states’ laws allow insurers to deny all coverage, even for conditions unrelated to the drugs used under right to try, a researcher in New York University’s medical ethics division told Bloomberg Law. 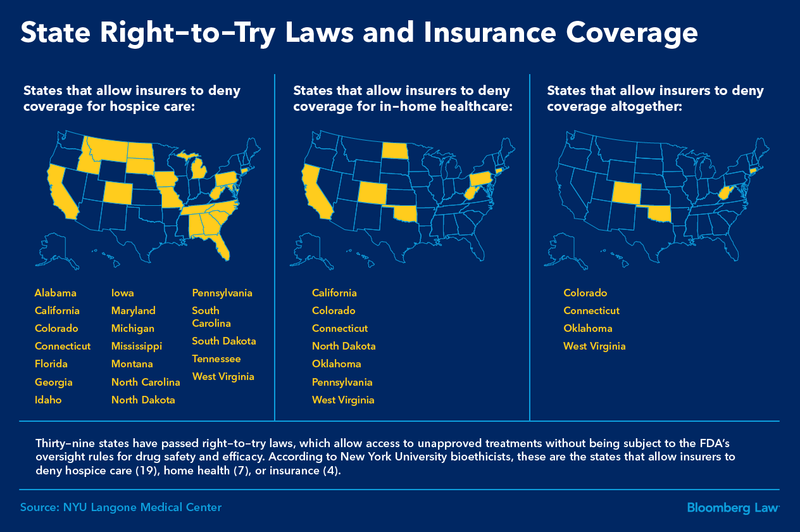 Seven states allow insurers to deny coverage for in-home health care, and four states allow insurers to deny coverage altogether, said Lisa Kearns, a senior research associate, who is part a working group on expanded access and has concerns about right-to-try. Many patients who are terminally ill also meet the criteria to receive hospice care, which the National Hospice and Palliative Care Organization defines as a “team-oriented approach to expert medical care, pain management, and emotional and spiritual support.” Medicare covers hospice care for a patient who has been certified by a physician to be terminally ill with six months or less to live if the disease runs its normal course. The largest payer of hospice services is Medicare, which covered more than 90 percent of hospice patient days in 2014, according to a report from the Medicare Payment Advisory Commission. More than 1.38 million Medicare beneficiaries received hospice services from about 4,200 providers in 2015, totaling about $15.9 billion in expenditures. Treatments designed to relieve pain for terminally ill patients can cost more than $10,000 per month, according to a Health Affairs study, and an analysis from Medicare’s advisory panel said it pays $193 a day for the first 60 days of hospice care, and $151 per day after that. Wisconsin became the 39th state March 28 to enact a right-to-try law. It’s an indication that right-to-try continues to gain momentum as the state’s senior U.S. senator, Ron Johnson (R-Wis.) has led efforts in Congress to pass a national law as well. The House and Senate each have passed different versions ( H.R. 5247; S. 204), and President Donald Trump already has said several times he supports such legislation. While groups like the libertarian think tank Goldwater Institute have pushed for these laws, bioethicists and patient advocates generally oppose them. At the heart of the controversy is whether right-to-try is an issue of right of access or a move to undermine the FDA. Proponents say right-to-try laws provide a chance for terminally ill patients to explore all options available when there are no FDA-approved treatments on the market for that disease, and those patients are ineligible to enroll in a clinical trial. Opponents say the FDA already approves more than 99 percent of requests placed under its existing expanded access program for such drugs, and the attempt to skirt FDA drug-safety regulations could cause further damage to patients who are already are terminally ill. The National Hospice and Palliative Care Organization told Bloomberg Law March 26 that while hospice does not provide for most curative care, patients may revoke their hospice election to seek treatments at any time. Most hospices have counselors who would inform patients to guide them through the process. Medicare beneficiaries must meet certain thresholds to qualify for hospice, Richard Y. Cheng, a Dallas-based attorney with Dykema PLLC whose health law practice includes hospice issues, told Bloomberg Law. They must be eligible for Medicare Part A, which covers care in hospital, hospice, and other health-care settings. A physician or nurse practitioner must certify that the patient is terminally ill with six months or less to live, and the beneficiary also must sign a statement that they are choosing hospice in lieu of another Medicare-covered benefit to treat the terminal illness. The care also must be rendered by a Medicare-certified provider. Eligibility for hospice care under right-to-try, or even for participating in a clinical trial, likely would come down to why that patient is taking the drug, Cheng said in a March 29 interview. Holly Fernandez Lynch, a bioethicist at the University of Pennsylvania, told Bloomberg Law in a March 29 email that dying patients who seek experimental interventions through any means should be informed of the impact it may have on their other options, including eligibility for hospice care and restrictions on insurance coverage. Kearns acknowledged this argument but countered that right-to-try advocates are opposing established regulation through the FDA’s expanded access program, and “then they’re hiding behind insurance regulations” to defend this hospice provision on the other. The Senate right-to-try bill is available at https://www.congress.gov/bill/115th-congress/senate-bill/204; the House version is avaialable at https://www.congress.gov/bill/115th-congress/house-bill/5247.